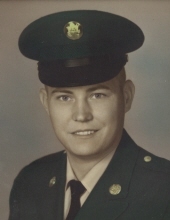 Herbert Lee O’Neal, 73, of Ashland, went to be with his Lord Saturday, March 30, 2019 at St. Mary’s Medical Center in Huntington, WV, his loving family at his side. Mr. O’Neal was born February 1, 1946 in Ashland, KY to the late Cecil and Mary Francis Clark O’Neal. He was also preceded in death by brothers Cecil Ray O’Neal and Danny O’Neal. Herb was a graduate of Paul Blazer High School and received his Bachelor’s Degree from Marshall University. He served his country honorably in the US Army during the Viet Nam War receiving the National Defense Service Medal, Viet Nam Service Medal, Viet Nam Campaign Medal, Army Commendation Medal and Good Conduct Medal. Herb retired in 2000 from The State of Kentucky as a Probation Parole Officer. His hobbies included UK Basketball and golfing. He was a Kentucky Colonel and a member of First Christian Church (D.O.C.). Herb leaves behind his adoring wife of 52 years, Shirley Lewallen O’Neal, brother, Michael O’Neal (Alma) of Catlettsburg, sisters, Kim Stephens (Bob) of Ashland, Patricia Baer of Ashland, Brenda Thompson (David) of Ashland, and his special fur baby, Angel. Funeral Service for Mr. O’Neal will be at 2pm, Wednesday, April 3, 2019 at First Christian Church, 1901 Winchester Ave. Rev. Larry Sivis will officiate. Final resting place in Golden Oaks Memorial Gardens with Military Honors by Kenova Post 93 and the US Army. Visiting hours will be 12pm until Service Time Wednesday at the Church. In lieu of flowers donations may be made to First Christion Church (D.O.C), 1901 Winchester Ave., Ashland, KY 41101. Neal Funeral Home, Catlettsburg, is assisting the family with arrangements. To send flowers or a remembrance gift to the family of Herbert Lee O'Neal, please visit our Tribute Store. "Email Address" would like to share the life celebration of Herbert Lee O'Neal. Click on the "link" to go to share a favorite memory or leave a condolence message for the family.